Three Buses Arrive in Lourdes, All Settled in, Mass and Great Dinner! Enjoy! 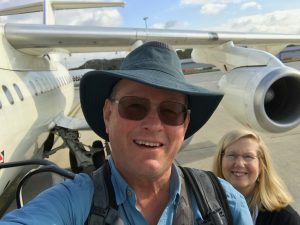 Always good on the first day to see everyone excited, happy and ready for spiritual adventures – and other kinds of adventures too. We had our first Mass with Archbishop Lucas from Omaha Nebraska at the St. Joseph Chapel here at the Lourdes Shrine. 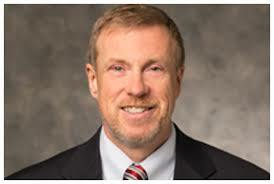 To hear our first homily click here. Enjoy our first day here in France as we start our pilgrimage in Lourdes. Tomorrow we have Mass at the Grotto of St. Bernadette and much more. Our first full day started with Mass in the Grotto of Lourdes where our Lady appeared to St. Bernadette in 1858. Archbishop Lucas presided at the beautiful and reverent Mass in the “cave.” You can hear/see his excellent homily here. We then gave people free time until 2:30 for going to the baths (though they filled up quickly). Many went exploring, shopping and out to one of the many cafes and restaurants for lunch. We gathered again at 2:30 PM for a walking tour of “The Footsteps of the Life of St. Bernadette” where we visited the Boly Mill where she was born, the abandoned prison called the Cachet where they lived in poverty and more. We also had a Rosary Procession around the shrine. Dinner at one of the many fine restaurants – this is France after all, the food and wine are excellent everywhere. Great first full day and people are already complimenting the organization and itinerary. We are very happy. Mass at Immaculate Conception Church at the eRelics of Saint Bernadette. You can see/hear the homily here. 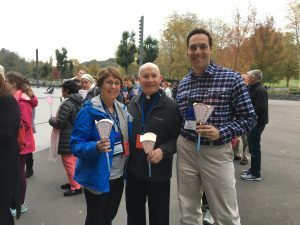 We also had an incredible opportunity to meet with the doctor in charge of all of Lourdes. He spent two hours with us explaining the detailed history of Saint Bernadette, the site and how miracles are determined by the medical team. 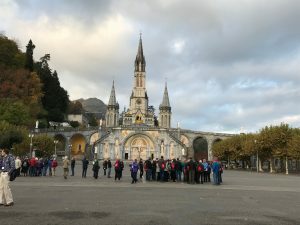 We walked the Stations of the Cross with life-size images up the mountain outside of the shrine and then everyone had free time to enjoy the rest of Lourdes before we leave tomorrow. Early departure from Lourdes and a beautiful drive through the countryside of France and Spain. Four hours at Loyola Spain as we toured the house of St. Ignatius of Loyola and had Mass in the beautiful church there. 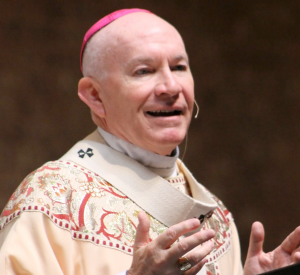 For Bishop Archbishop Lucas’ homily click here. 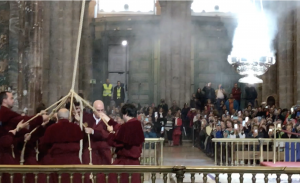 Day 6: Santiago de Compostela all day; Huge Incensor! Joined all the pilgrims arriving from the long El Camino pilgrimage. Many of our group got up early and walked part of the El Camino – the Way of St. James. Mass at the cathedral with the Archbishop presiding. You have to see the huge incensor, called the “botafumero” which takes eight men to operate. Lots of free time for great food, shopping, exploring, fellowship and more. Emjoy! Left Santiago de Compostela after a great breakfast and headed to Bon Jesus. This is one of the most remarkable churches that anyone has ever seen with an altar piece of life-size figures at the crucifixion of Jesus and gardens and patios that go down the side of the mountain with beautiful trees and flowers and manicured gardens. We then drove to Coimbra Portugal where we had 2 1/2 hours free to explore the city, eat lunch, do some shopping and have a lot of fun together. The weather has cooperated nicely. After lunch we went to the Carmelite convent where Sister Lucia was a Carmelite nun for 57 years after her apparitions in Fatima. You can hear the homily here. 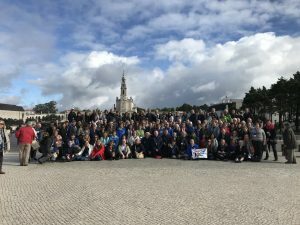 We arrived in Fatima after dark and everybody had dinner. We had a lot of fun on the buses today where I pretended I was on “Catholic Answers Live” and did Q & A from people on the buses. Everyone seemed to enjoy it. We arrived in Fatima after dark and everybody had dinner. We had a lot of fun on the bus today where I contacted “Catholic Answers Live“ right pretended I was on the radio show and to questions from people on the buses. Day 8: All Day Fatima! 100th Anniversary! We started the day with a wonderful breakfast at our Sancta Maria hotel before taking a tour of the whole shrine and the homes of the three children. Then archbishop Lucas celebrated with other two priests at the Chapel of the Apparition where 70,000 people saw the sun dance 100 years ago. You can hear/see the homily here. Then we boarded our buses and went to the village where the children lived and we toured their homes and the places of the apparitions and prayed the Rosary along the walk up to the place the angel gave the children their first Holy Communion. This was followed by an excellent lunch and a lot of time for shopping at a huge Fatima shop which covered about an acre, or at least it seemed too. We gave everyone the afternoon off to pray, explore, rest, shop or whatever they wanted to do. The next video will be our final Mass and dinner with thanks and sharing. Will have a lot of comments and farewells from all the pilgrims. You can watch the entire 90 Minute Pilgrimage Video below. 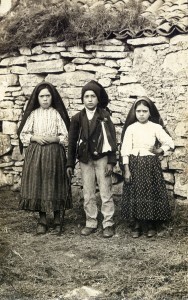 KVSS Lourdes & Fatima Movie from Steve Ray on Vimeo. 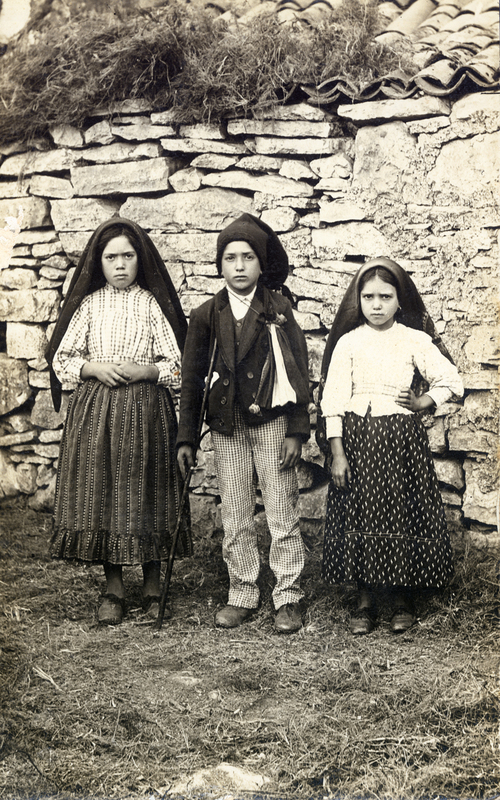 This trip too place during the 100th Anniversary of Our Lady of Fatima’s apparitions to the three little shepherd children in Portugal. This pilgrimage was in conjunction with Spirit Catholic Radio along with Archbishop Lucas of Omaha Nebraska. 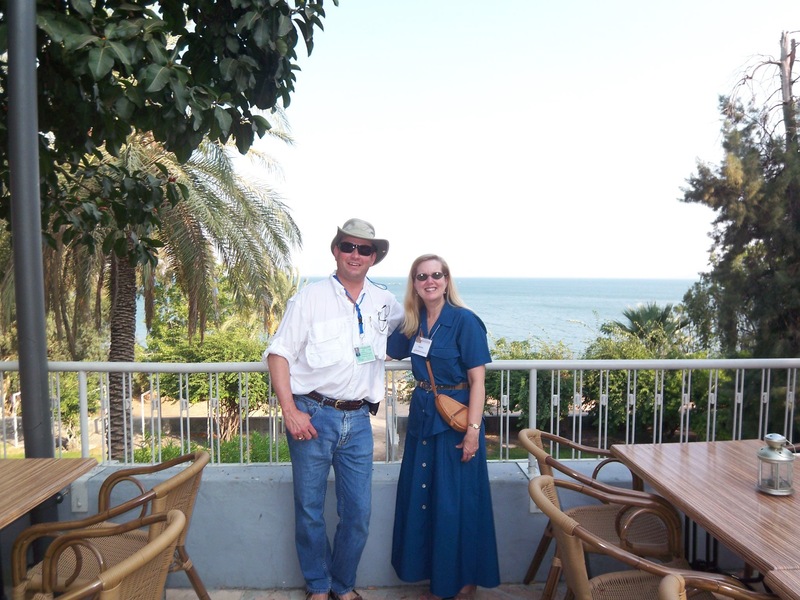 We have the best enthusiastic Catholic guides and Steve & Janet Ray will be with you every step of the way. The best hotels await you, the finest cuisine will be set before you. Prayers along the way, Mass at the most sacred sites as we are all immersed in some of the most visited Marian shrines in the world. Fatima, Lourdes, the tomb of the Apostle St. James in Santiago de Compostela where the El Camino pilgrimage concludes, the Eucharistic Miracle of Santarem, Loyola with Mass where St. Ignatius gave his life to God and much more. 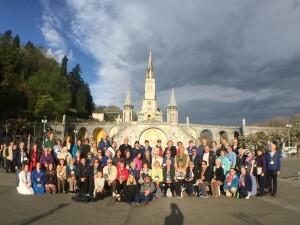 To see videos and stories from past Fatima-Lourdes pilgrimages, click HERE.